Usually, when we see toys that can be used in conjunction with an app, the toy generally focuses on the iPhone or iPad. Whether its an interactive case, an easel or an iPotty, the toy is usually made to complement the device. Now, Disney is changing this up a bit and has released a brand new app that complements an already existing toy, the Disney Ultimate Dream Castle. 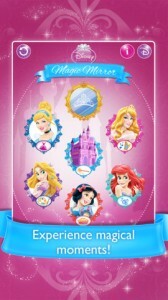 Disney’s new “Disney Magic Mirror’ app has been made especially to add extra features to the 2013 Disney Ultimate Dream Castle. If your child is lucky enough to own one of these (they cost nearly $90 on Amazon! ), then the extra four dollar investment for some interactive fun with the iPhone will likely spark your interest. Castle Events that include fireworks, floating lanterns and glowing rainbows. Its nice to see an after-market app that works with a beloved toy, but isn’t the sole focus. In this way, Disney is increasing the amount of interactivity and fun for owners of the Ultimate Dream Castle that would not otherwise be there. Even if your child does not own the Ultimate Dream Castle, the app still has lots of fun content and games to explore! To download the “Disney Magic Mirror” app for $3.99, click the Apple iTunes App Store button below.